These Speed-Pro Digital Diamond Profile (DDP) hypereutectic pistons feature a new digital actuated diamond turning process that produces precision skirt profiles. This new Digital Diamond Profile (DDP) technology creates a unique barrel profile of the pistons, promoting an oil wedge between the piston skirt and the cylinder wall. They feature a newly designed ring groove geometry using Thermal Arching Compensation (TAC) that machines the piston ring grooves with an uptilt to offset thermal arching distortion. This squares the ring face up to the cylinder wall for increased power and decreased oil consumption. The Speed-Pro Digital Diamond Profile hypereutectic pistons feature the next generation of Duroshield skirt coating, reducing friction across the entire rpm range and increasing wear resistance for longer life and superior noise and vibration reduction. They also use precision-machined piston pin bores that allow for either fixed or floating wrist pins. The pistons come weight-matched to a 4 gram (+/-2 grams) maximum variation within every engine set. We also have other sizes available. Can be used with other Chevrolet 350ci engines as a performance upgrade. Flat head w/4-valve reliefs. Perf. or reg. duty operation. Not OE duplicate Wt. ; Use as sets only. 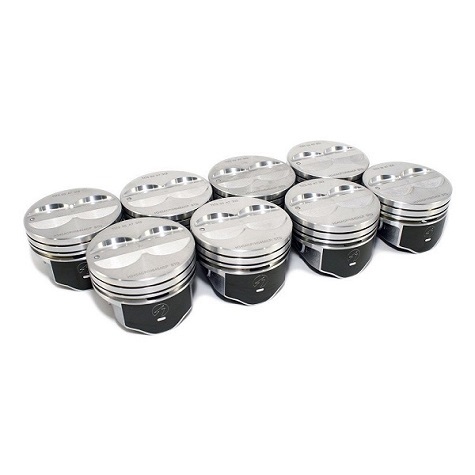 These pistons can be free floated but LR63 locks must be purchased separately.